kiki nicole is an agender writer and multimedia artist. they work to un/body, un/gender, and re/new via deconstruction of language, video, and performance often centering the intricacies of the isolated queer black femme existence. their work travels through genres to archive the depths of the black interior and to unflinchingly self document the processing of mental illness and trauma. nicole is a 2016 Pink Door Fellow, a cohort of the 2017 Queer Emerging Arts Residency, and a 2018 Winter Tangerine Fellow. . 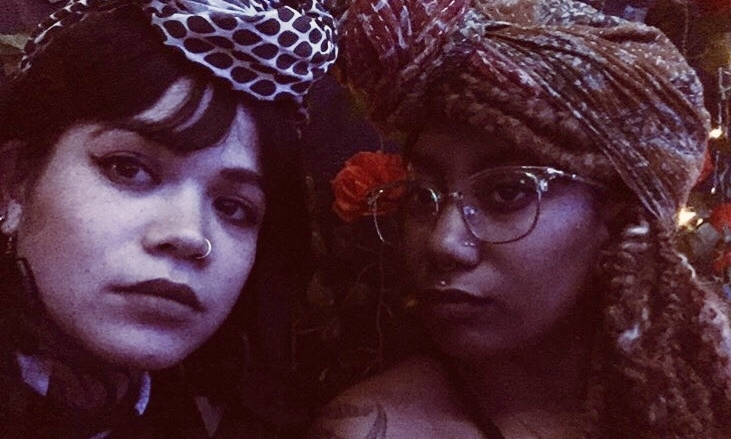 They have displayed work in group shows at UNA Gallery, Paragon Arts Gallery, and Screaming Sky Gallery, and in Oakland in the collaborative performance piece, “The Niggas Speak of Rivers.” Their forthcoming chapbook is to be released in 2019 from Honeysuckle Press. ariella tai is a video artist, film scholar, and independent programmer from queens, new york. they are interested in the materiality of black bodies and black performance as vernaculars which subvert, interrupt, or defy the diegetic cohesiveness of narrative. they currently re-appropriate glitch and video process existing media in attempts to rupture and reconstruct some of the messier emotional realities of black femme existence. tai was a 2017 Summer New Media Fellow at Open Signal and have displayed work in Paragon Arts Gallery. they have curated programs for the Portland Black Film Festival, the Cascade Festival of African Films, and "they said don't bring her home," a film and performance series supported by a 2015 Precipice Fund award.